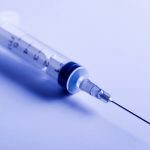 Yesterday, the U.S. Food and Drug Administration (FDA) made public information regarding import refusals for the first month of 2018. 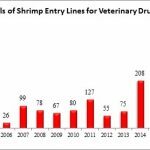 In January, the FDA reported that 5 out of the 116 (4.3%) total seafood entry line refusals were of shrimp for reasons related to banned antibiotics. 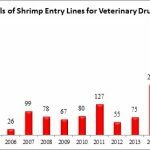 Last month was the highest number of entry line refusals of shrimp for banned antibiotics reported for a month since April 2017 (19). 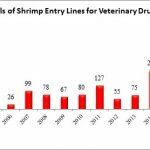 In the eight months between April 2017 and January 2018, the FDA had reported only thirteen total shrimp entry line refusals for reasons related to banned antibiotics. Also in January, the FDA reported refusing fourteen (14) shrimp entry lines because of salmonella, with all but one of these shipments originating in India. Three separate Indian exporters – Falcon Marine Exports Pvt. Ltd. (1 entry line); Sandhya Aqua Exports Pvt. Ltd. (1 entry line); and Jagadeesh Marine Exports (11 entry lines) – were identified as the manufacturers of the refused shrimp. Two of the three – Falcon Marine Exports Pvt. Ltd. (Dec. 20, 2017) and Sandhya Aqua Exports Pvt. Ltd. (Dec. 13, 2017) – were recently added to Import Alert 16-81 (“Detention Without Physical Examination of Seafood Products Due to the Presence of Salmonella”). The manufacturer of the only non-Indian shrimp entry line refused for salmonella, PT Bumi Menara Internusa of Indonesia, was added to Import Alert 16-81 on December 14, 2017. The combination of the continued use of antibiotics in shrimp aquaculture and the presence of food-borne pathogens in shrimp products imported into this country again spotlights concerns regarding the development and spread of antimicrobial resistant bacteria. While foreign shrimp producers and shrimp importers have downplayed the threat posed by antibiotics in shrimp aquaculture, these companies have declined to provide any justification for the industry’s failure to eradicate the use of antibiotics in countries like India and Vietnam.